Most source data indicate the relationship of each person to the head of household, but relationships among other household members are rarely specified. 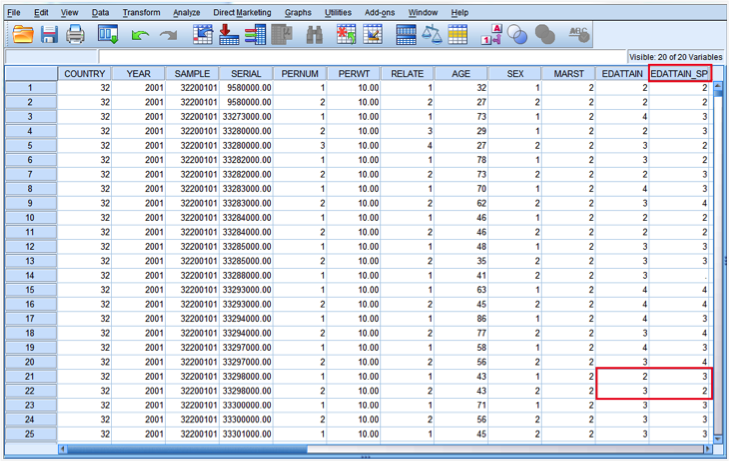 Identifying these relationships and copying values across records requires complex stats-package manipulations. IPUMS family interrelationship variables identify the location within the household of every person’s mother, father, and spouse. The IPUMS data extract system uses this record location information to find the relevant family member data and attach the data as a new variable to each person record in a dataset. Most source data indicate the relationship of each person to the head of household, but relationships among other household members are rarely specified. Identifying these relationships and copying values across records requires complex stats-package manipulations. IPUMS family interrelationship variables identify the location within the household of every person’s mother, father, and spouse. 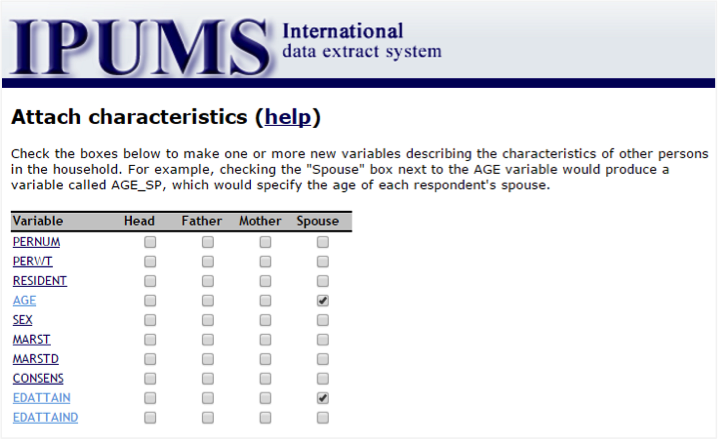 The IPUMS data extract system uses this record-location information to find the relevant family-member data and attach the data as a new variable to each person record in a dataset. 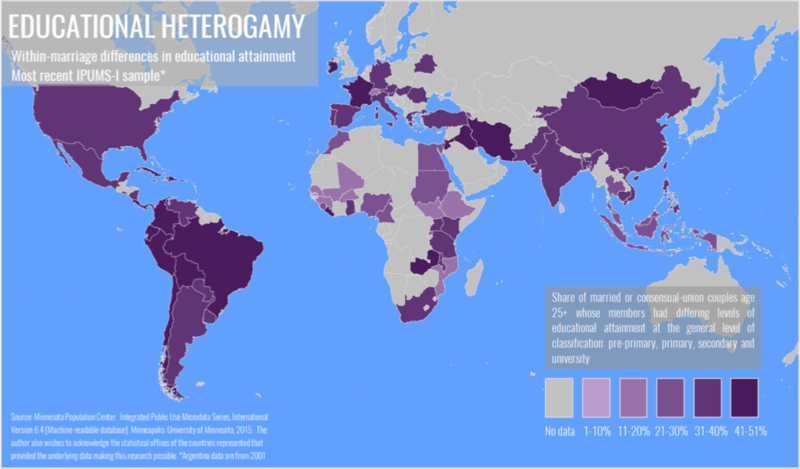 To demonstrate this feature in action, let’s examine within-marriage differences in educational attainment across the globe. As a Midwesterner in my late 20s, I go to a lot of weddings. Eight are on the docket for 2016. All these weddings have me thinking–like any good social scientist– about assortative mating (people marrying people who are like them) and how it varies around the world. To begin exploring the topic, I’d like to calculate and visualize the proportion of married and in-union couples who are educationally “mismatched” for each country available from IPUMS-International. For my analysis, I’ll need age, marital status, and educational attainment variables for each individual in my sample. I’ll also need an individual-level variable that indicates educational attainment of spouse or partner. Rather than compute this variable myself in a stats package, I’ll use the attach characteristics feature to include this variable in my IPUMS data extract. To download an IPUMS dataset that contains these variables, I’ll build my data extract as usual, selecting the variables and samples necessary for my analysis. Once I’m satisfied I have all the data I need (ID variables and weights are automatically included in every IPUMS data extract), I begin the checkout process by clicking the green “View cart” button in the top right corner of my screen. The next page summarizes my variable and sample selections. Clicking “Create data extract” brings me to the extract request page where I’ll find the option to attach variables that describe other of household members. Here, I can specify the format in which I’d like to receive my data (SPSS, STATA, or SAS). I can customize my sample size– keeping file sizes manageable–or subset my sample by selecting cases that meet criteria defined by me (women only, working-age only, etc.). To add educational attainment of spouse as a variable in my extract, I’ll choose the attach characteristics option before I submit my extract. By checking the “EDATTAIN” box under spouse, I add a new variable for educational attainment of spouse to my dataset. All persons in the extract who reside in a household with their spouse will receive a value for this new variable. Unmarried persons or persons who do not live with their spouse will receive a missing value. The extract system automatically generates a unique name for the new variable called “EDATTAIN_SP” and adds it as a column in my dataset. Only the variables I selected while building my extract are available to attach. I can use the use the back button on my web browser to return to the extract request page if I’ve forgotten something. From there I can change or add to the variables I’ve selected. With education of spouse attached to each person record in my data extract, I can identify married couples with disparate levels of education by computing one new variable. A cross-tabulation later and voilà, I have the proportion of educationally mismatched couples in every country in my extract. IPUMS-International provides GIS boundary files with attribute data consistent with IPUMS-International geography codes. Using the world map boundary file, I’m able to map my results and quickly identify regional trends I’d like to investigate further. You can find a variety of IPUMS-based research on within-marriage educational trends in the MPC bibliography. IPUMS attached characteristics facilitate the study of couples and families. The feature helps situate individuals in the context of their families and households and simplifies analyses that consider household member characteristics. Family interrelationship variables and attached characteristics are features of IPUMS-USA, IPUMS-CPS, IPUMS-International, and the North Atlantic Population Project (NAPP). You can find more step-by-step video tutorials on attaching characteristics to your data extract, via YouTube Minnesota Population Center.